Rectangular black plaque with nowy head. Plaque has a decorative border, with banners featuring the names of the regiments engagements. Text is carved, surrounded by decorations including the regimental insignia and floral decorations. All detail on the plaque is in gold. 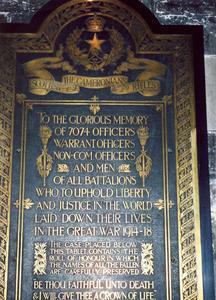 Plaque references an accompanying roll of honour, displayed beneath the plaque. 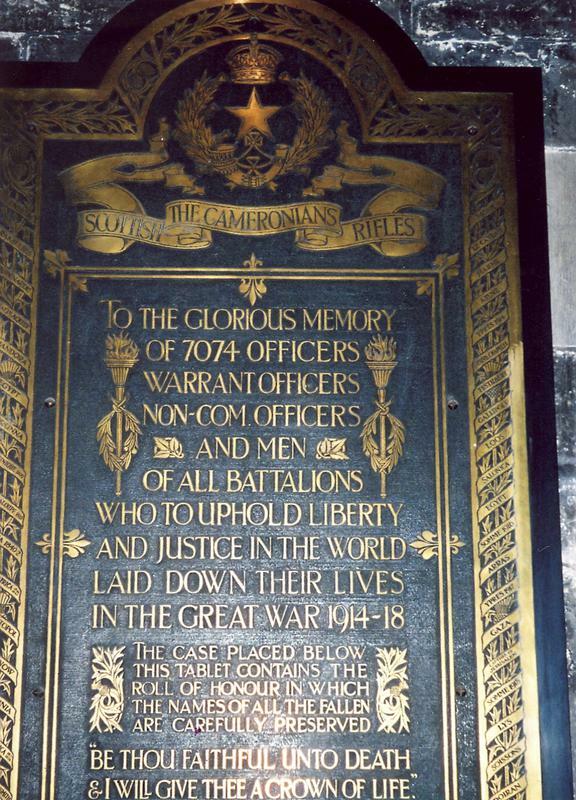 SCOTTISH/ THE CAMERONIANS/ RIFLES/ TO THE GLORIOUS MEMORY/ OF 7074 OFFICERS/ WARRANT OFFICERS/ NON-COM OFFICERS/ AND MEN/ OF ALL BATTALIONS/ WHO TO UPHOLD LIBERTY/ AND JUSTICE IN THE WORLD/ LAID DOWN THEIR LIVES/ IN THE GREAT WAR 1914-1918/ THE CASE PLACED BELOW/ THIS TABLET CONTAINS THE/ ROLL OF HONOUR IN WHICH/ THE NAMES OF ALL THE FALLEN/ ARE CAREFULLY PRESERVED/ "Be thou faithful unto death/ & I will give thee a crown of life."